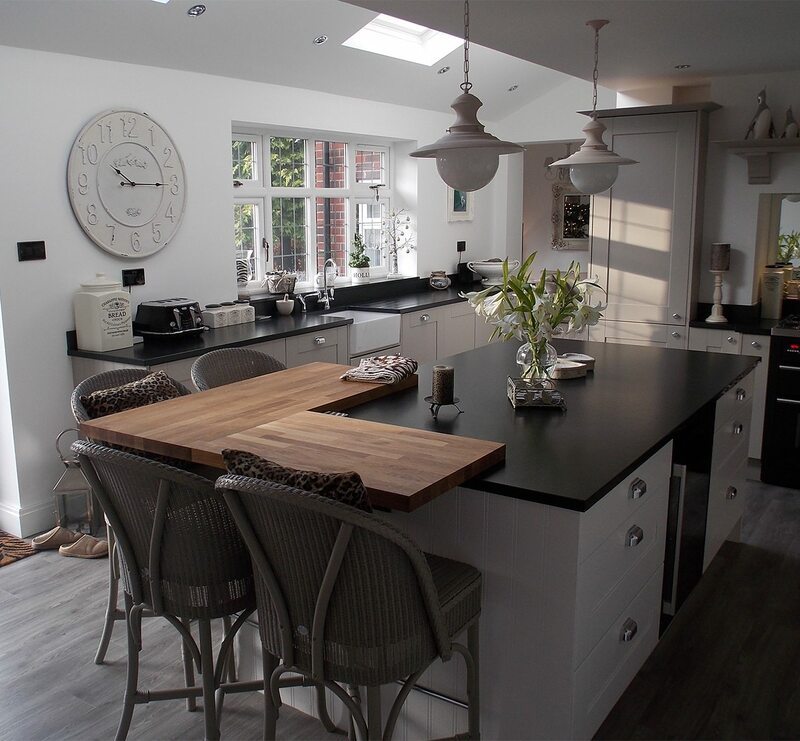 Wanting a kitchen where they could spend more time family together, Mr and Mrs Walker were delighted with what Kitchen Design Centre created: a shaker-style kitchen with a few distinctively modern touches. 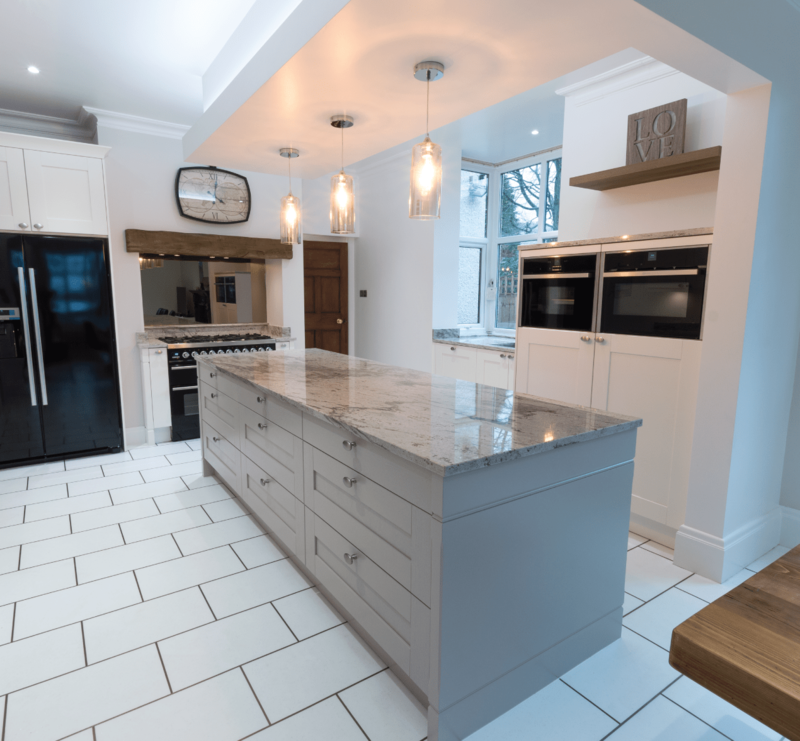 Having decided to revitalise their kitchen, Mr and Mrs Walker from Rochdale knew they wanted to turn it into a true family centric space, where they could spend more quality time together. “A small kitchen wasn’t really working for us.” explained Mrs Walker. 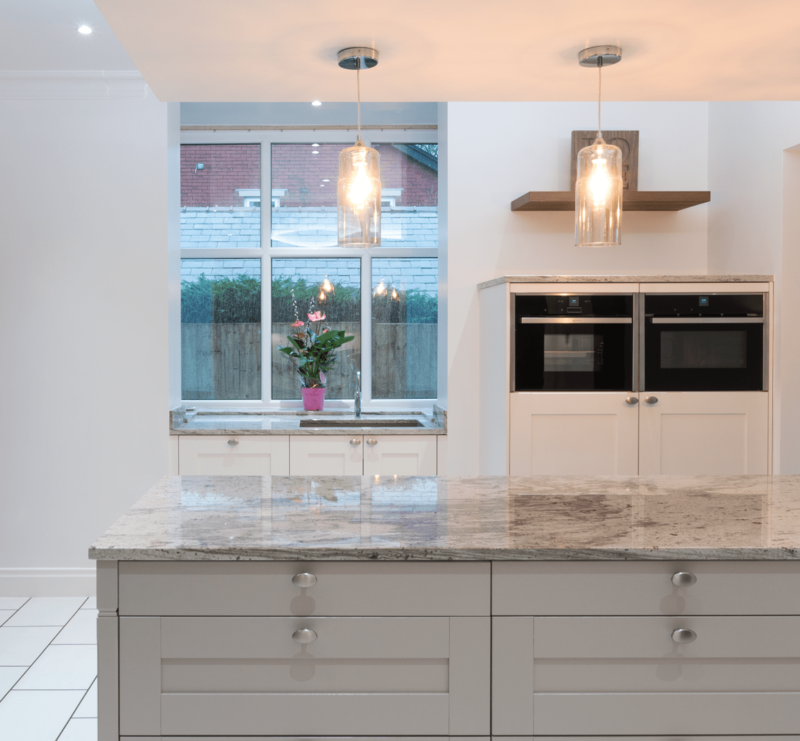 With the help of the Manchester showroom’s talented designer Suzanne Carter, the couple merged their existing kitchen with their under-utilised dining room. 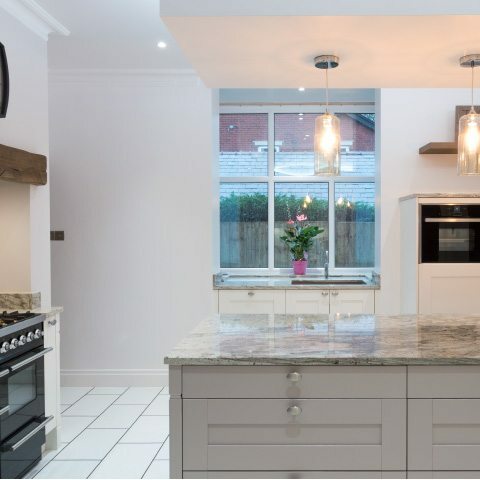 The result was a spacious, open-plan shaker style kitchen that blends traditional and modern aspects into a unique, timeless design – becoming not only a fabulous room to prepare delicious meals, but also a wonderful social space for the whole family to enjoy. 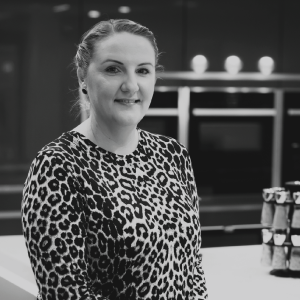 With the brief set out, Suzanne began bringing the Walkers’ vision to life as a traditional shaker-style kitchen that complements their period property in Rochdale, but with some superb modern twists. 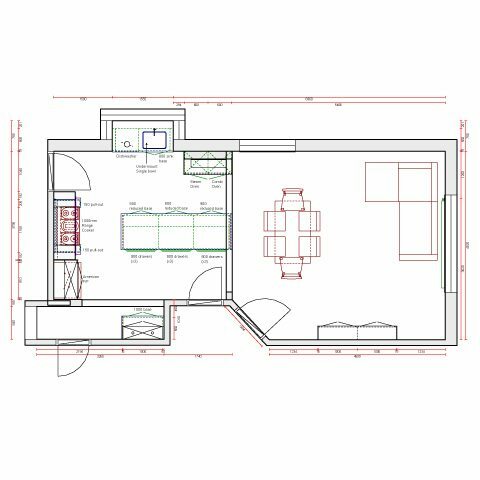 She also designed a brand-new utility room to give the couple some extra storage and workspace. The Walkers opted for shaker style cabinetry with lacquered doors in a mix of white and cashmere, and finished in an Oxford ash effect. 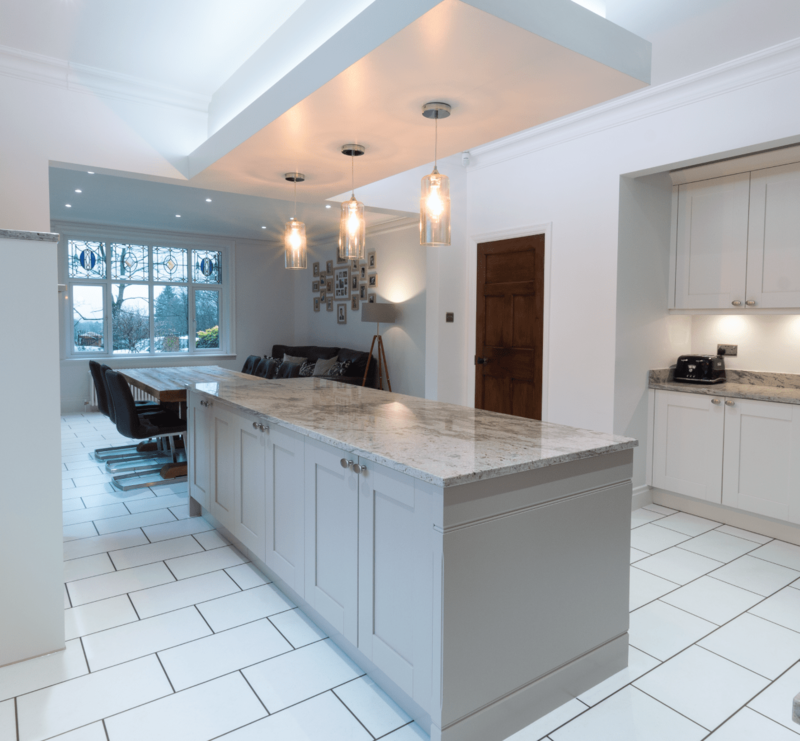 They’re paired with kitchen worktops in an elegant River Valley White natural granite, and Light Vesuv laminate worktops in the utility room help to complete the chic, sophisticated colour scheme. 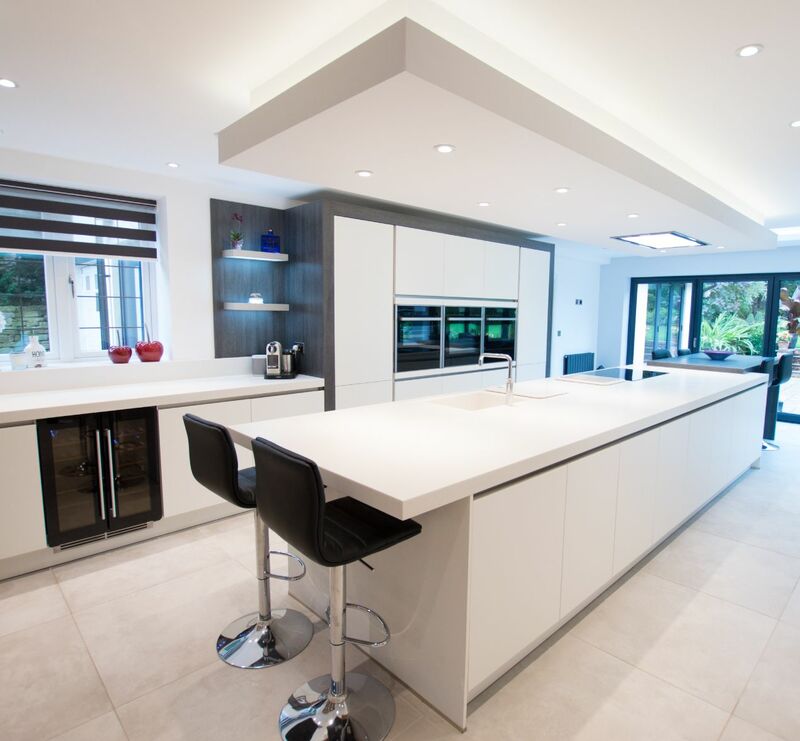 To ensure effortless functionality to match its stunning look, the kitchen was supplied with a variety of high-performance appliances. 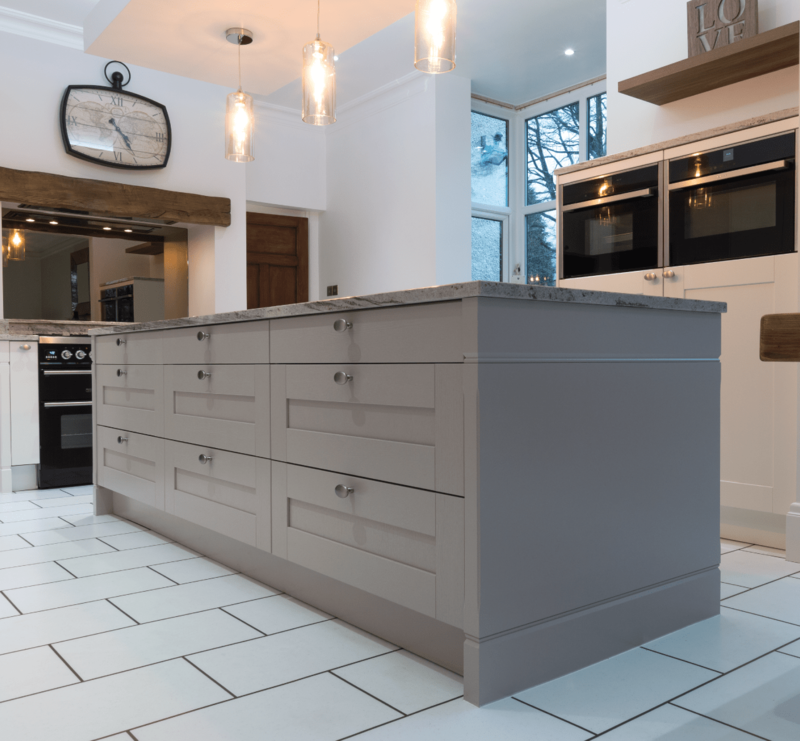 More traditional design elements include a powerful Ilve range cooker that’s enhanced with a Faber integrated cooker hood and a timber mantle feature, as well as a freestanding Neff American fridge freezer. Meanwhile, a Neff compact steam oven and compact microwave are housed in a modern, freestanding shaker style cabinet. 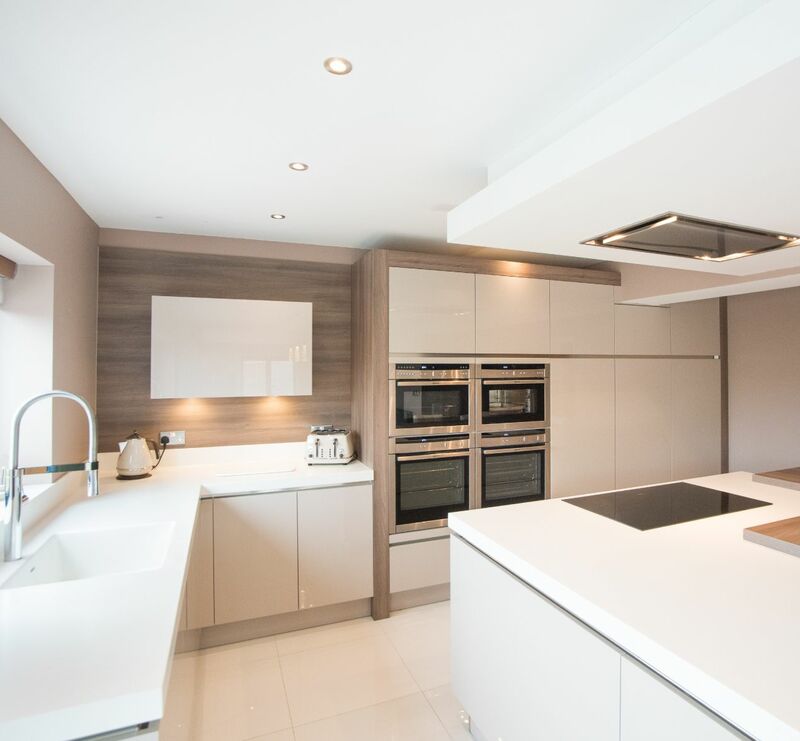 All the appliances are carefully arranged around a central kitchen island, designed to give the Walkers valuable working space and huge amounts of storage while cooking, while also doubling as a perfect space for socialising. 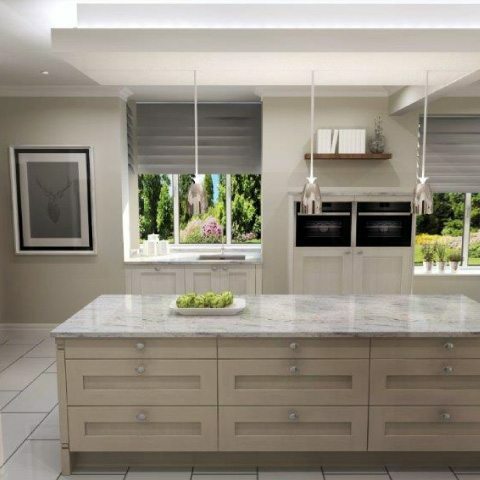 "We’re over the moon with Kitchen Design Centre’s service. The designer, the builder, the fitter…everyone was just brilliant. We’d definitely recommend them!" "The clients from Rochdale were lovely to work with, from the moment they walked into the showroom. They had an idea of what they wanted but were looking for some guidance too, and were impressed with all the designs. 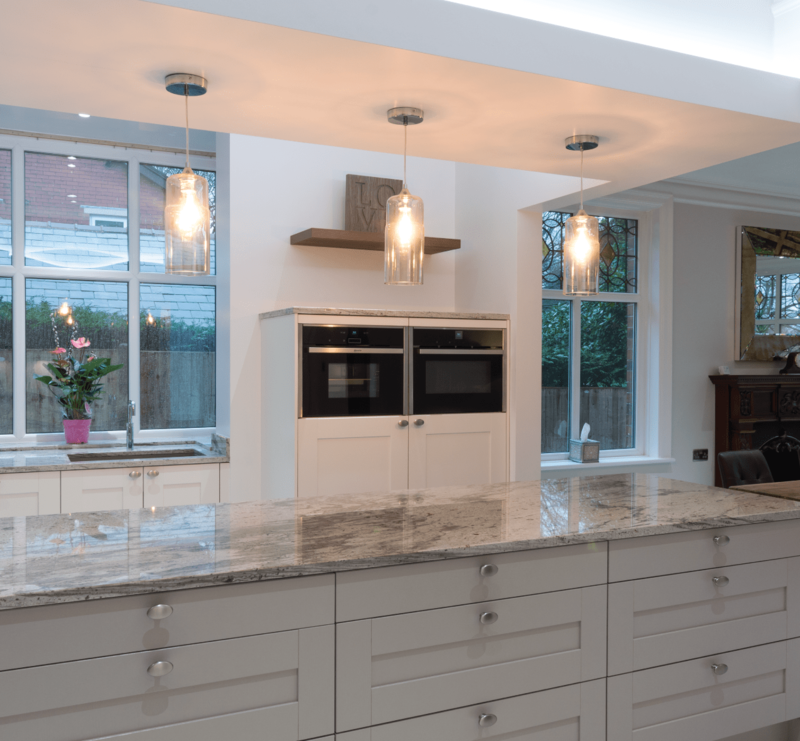 The kitchen I designed for them had a lot of natural features, from the marble-effect countertops to the range cooker’s timber mantle feature. 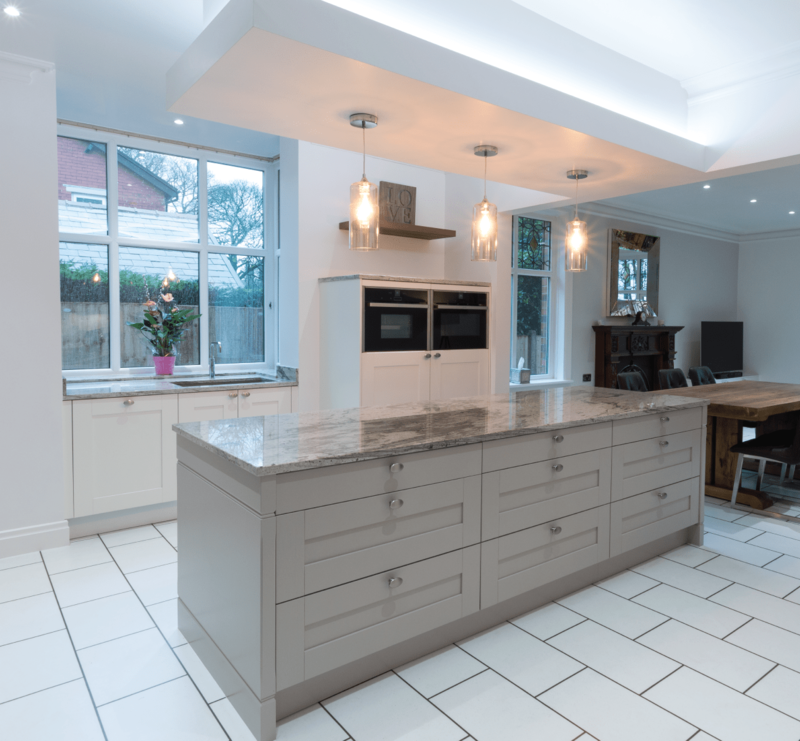 It was a great project to work on, and Mr and Mrs Walker were an absolute delight. "